. 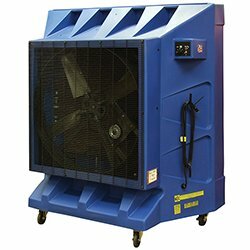 Cool off with this TPIHeavy Duty Evaporative Cooler. 36" Direct Drive, 1/2 HP - 12.4 amps, 120 Volts. Cools up to 2500 sq. ft.. 15-25 degree swing depending on climate and humidity. 1 Speed Motor - CFM 9600. 32 gallon internal water tank provides 5 to 8 hours of cooling. Features 3/4" garden hose connection for longer operating times. Shipped completely assembled, ready to use. Made in the U.S.A.. Dimensions 23 x 62 x 67 .. If you have any questions about this product by Unassigned, contact us by completing and submitting the form below. If you are looking for a specif part number, please include it with your message.